Monthly chew for the prevention of fleas, heartworm and intestinal worms in dogs. Monthly tasty chew for the prevention and control of fleas, heartworm and intestinal worms in dogs. Sentinel Spectrum Tasty Chews provide broad spectrum parasite protection. Sentinel Spectrum Tasty Chews prevent heartworm (Dirofilaria immitis) and control roundworm (Toxocara canis, Toxascaris leonina), hookworm (Ancylostoma caninum), whipworm (Trichuris vulpis), tapeworm and flea infestations in dogs. Once a month, ideally on the same date. If a dose is overdue by <15 days, treat immediately and resume monthly dosing. If a dose is missed by 15-30 days, heartworm prevention can be maintained if treated immediately and monthly dosing resumes for at least the next 2 months. If a dose is missed by >60 days, a veterinarian must be consulted in case the animal has contracted heartworm. Dosing may be recommenced, and a blood test for adult heartworm must be performed after 6 months. Sentinel Spectrum Tasty Chews containing 2.3mg milbemycin oxime, 22.8mg praziquantel and 46mg lufenuron in orange pack. Sentinel Spectrum Tasty Chews containing 5.75mg milbemycin oxime, 57mg praziquantel and 150mg lufenuron in green pack. Sentinel Spectrum Tasty Chews containing 11.5mg milbemycin oxime, 114mg praziquantel and 230mg lufenuron in yellow pack. Sentinel Spectrum Tasty Chews containing 23mg milbemycin oxime, 228mg praziquantel and 460mg lufenuron in blue pack. 97% of dogs will take the tasty chews straight from the hand. Otherwise, the dose can be added to a small meal or placed directly in the mouth, similar to tablet dosing. Sentinel Spectrum Tasty Chews come in packs of three (a 3-month supply) and six (a 6-month supply). 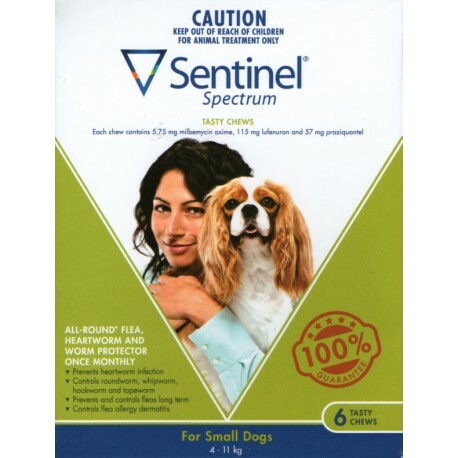 Sentinel Spectrum Tasty Chews can be safely used in puppies from 6 weeks of age, breeding males and females, and collies sensitive to ivermectin. Sentinel Spectrum Tasty Chews have been safety tested at up to 10 times the recommended dose. If an animal with adult heartworm infection (and therefore circulating microfilariae) is given Sentinel Spectrum, a transient shock-like reaction can occur. To avoid this, dogs should be tested for adult heartworm and treated if necessary, before starting Sentinel Spectrum. Happily used this product foe couple of years with no issues.